Summary: Lydia is having a party—it’s a party she hosts every year for six women friends who treasure the midwinter bash. Over a table laden with a feast of food and wine, the women revel in sharing newsy updates, simmering secrets, and laughter. As this particular evening unfolds, Lydia prepares to make a shattering announcement. 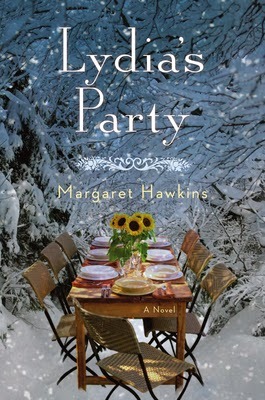 When I read the description for LYDIA'S PARTY by Margaret Hawkins, I figured it would be a book that I might enjoy. I am a sucker for stories about these strength of women and their friendships, and LYDIA'S PARTY certainly seemed to fit the bill. Better yet, the book received a starred review from Kirkus so I decided to give it a shot. If I'm being entirely honest, I liked LYDIA'S PARTY but I didn't love it like I had hoped. LYDIA'S PARTY is the story of Lydia and her friends who meet each year at a party hosted by Lydia. Lydia's parties are always known for the vast amount of food and drink as well the good times shared between the women. This year, Lydia has a major announcement to make that will forever alter the future of the party. Despite the bad news, Lydia's friends manage to pull together for Lydia's sake; and in the process, they discover things about themselves and the importance of friendship. Based on the book's description, I had a feeling that LYDIA'S PARTY wasn't going to be a joyful book; however, I had hoped that the overall messages about friendship would manage to make it a worthwhile read. That was definitely the case. Even though Lydia was facing a very sad situation, I was happy to see that many of the messages from the novel were upbeat and positive. That's not to say that I didn't feel like crying a few times while reading this book -- many of the characters were facing issues in their lives, but I found strength in their resilience and perseverance. One thing I definitely appreciated about LYDIA'S PARTY was the writing. I had never read a book by Ms. Hawkins before, but I was definitely impressed with her prose. She did a great job of developing many female characters and I love the way she explored female relationships -- and by that, I don't mean just friendships. In addition, she touched upon some very real issues that women of a certain age face; and I think she did it in a fair and compassionate way. For the most part, I enjoyed LYDIA'S PARTY but I just don't know if the book was for me. I think one reason that LYDIA'S PARTY didn't resonate with me as much as I had hoped was because the characters were all a bit older. I hate to admit that I'm not all that far away from their ages, but they just seemed to be in very different places in their lives than I am. While there were many women in the story with a variety of problems, I never found one that I could truly relate to. Nor did I find one that even reminded me of any of my friends. I know it's not necessary to like or relate to a character to appreciate a story, but in this case, I think it would have helped. LYDIA'S PARTy would, without a doubt, make a good book club selection -- especially if your group is made up of middle-aged (or older) women. I wasn't able to find a reading guide (which is a shame), but I do think there are many themes to discuss. Some of the topics your friends might want to explore is love, marriage, parenting, loss, grief, regret, aging, and of course female friendships. Since the party is the major setting for the story, there is also some potential for some great food and drink ideas! Overall, I enjoyed LYDIA'S PARTY and think it will appeal to fans of women's fiction. This might resonate more with me since I have a few years on you. The plot sounds similar to another book I read but I can't remember the name of it. I love books about women friendships as well. I really want to read this one.